Gilliam, LA - Texas racers dominated the winners circle this past weekend at the NHRA Lucas Oil Drag Racing Series event at Thunder Road Raceway Park. Gilliam, LA - Thunder Road Raceway Park has named Steven Quien Track Manager of the NHRA sanctioned quarter-mile dragstrip facility in Gilliam, La., just north of Shreveport. Quien will begin his tenure on July 1, with more than 25 years of experience in dragstrip operations dating back to 1973 at Minnesota Dragways. 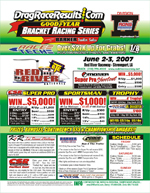 Norwalk, OH - Following another record season for the popular Summit SuperSeries grassroots program, the International Hot Rod Association (IHRA) is pleased to announce its Summit Team Finals schedule for the 2012 racing season. Evandale, TX - So if you like Side by Side fast action and watching the best of the best in Heads up Outlaw racing then come out and enjoy the High Velocity Impact Racing series this year as it rolls into Thunder Road Raceway Park in Gilliam, LA., and Ben Bruce Memorial Airpark in Evadale, TX. Gilliam, LA - Kenny Kelly from Monroe Louisiana drove his 02 Undercover dragster to a $5000 payday Saturday at Red River Raceway at the Moser sponsored DRR race.